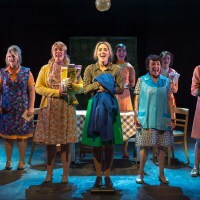 All singing, all striking, this musical recalls the gender pay disputes at Fords in the 1960s. Although women now run everything, from governments downwards, many still have lower wages than men. The show is derived from the film and comes to Ipswich from the Queen’s Theatre, Hornchurch. Douglas Rintoul’s production is people’s theatre, full of working class humour and vitality. Barrack room language had nothing on the women machinists’ room. Harold Wilson (Graham Kent), with pipe and Gannex coat, and Barbara Castle (Claire Machin) live warmly again. Prime Ministerial aides were depicted as capering ninnies even then. Rita, the main character, is a fictional figure based on several of the strikers. I doubt that the cigar-chomping American owner ever really tore her TUC speech up. But Daniella Bowen gives a heart-on-sleeve performance, showing the determination and human cost of the strike. See this serious and funny show at the New Wolsey Theatre, Ipswich until October 15.